TechnoJourney taught junior students Internet skills and responsible digital citizenship. Shadi, what did you learn in TechnoJourney that you think you could use next year in Grade 4? I learned to bookmark sites. I think I could use this when I’m doing projects next year. Also, last year I made a slide show about animals and if I have to make one next year, I’ll know how to bookmark sites to find information for it. Do you think all kids should learn these Internet skills? Yes! I found information more easily. I didn’t need to ask my teacher for help as much as I did before. Students had fun using Google Maps to locate their homes. Hannah, what did you learn that might help you in the future, at home, or at school? If I had to go to a friend’s house and my parents didn’t know where it was, I can now use Google Maps to find a place. I think I’ll use the Internet for homework. I learned that you can find other videos than just on You Tube. These videos can even help me do homework. I don’t always have to read information; I can watch it too. I learned how to find sites on the Internet that I can trust. I learned to check the address at the top when I did a search. If the URL ends in .gov or .com I can probably trust it better than sites from ThinkQuest that are written by kids. Tami, which parts of the TechnoJourney project were the most fun? I really liked watching the videos. For which projects do you think you might use your new Internet skills? Last year we did TechnoAnimal and TechnoHero. I think I would search better now. I recently conducted an interview with the classroom teacher upon the completion of teaching TechnoJourney to learn more about her thoughts and ideas about the experience. Your students just spent the past few weeks completing activities from the technology project TechnoJourney. What was your overall impression of the experience? I was really impressed with the project. It’s a great computer curriculum. The assignments were easy to follow and the students learned the skills. TechnoJourney is full of a wide-range of Internet-based activities. You selected several from the technology project to use with your students. How did you make that decision? The students were engaged and focused in all the TechnoJourney activities. I based my choice on what I thought was relevant for my grade 3 students and what skills I knew they would be able to apply in other areas of the curriculum. If I had to eliminate any of the activities, I would probably not do the Arcade again. The students really enjoyed playing the games, but I think they have a lot of opportunity to do that outside of school. Your students have spent the past few weeks engaged in Internet-based activities. What skill do you think your students learned that is the most valuable? Why? Learning effective search strategies was most valuable for my students. They learned to identify trustworthy sources on the Internet. I saw them apply these skills in other themes we studied in the classroom. When they undertook their research for both our Oceans project and the Body project, students showed much more independence and asked for less help from me as they were searching for information online. I often hear that technology skills should not be taught. Do you believe that teaching Internet research skills to your students was a good use of instructional time or do you think they would just learn them on their own? I definitely think that TechnoJourney was an important use of our time in the computer lab. Not only did the students gain new skills, but I learned a lot too! Learning the search skills formally as opposed to just figuring them out on their own was certainly beneficial. I believe the students will retain these skills more effectively since they’ve explored and tried them out, talked about them during instructional activities, and finally reviewed them when they shared their new skills with another class in our final Internet Tour Guide activity. TechnoJourney was scheduled for 10 classes, but ended up being 12 classes due to the addition of the Internet Tour Guide activity. At first glance, this does not seem like a lot class time, however, with only one computer class per week the reality is that this technology project has stretched from January to May. That is a lot of time to spend on one technology skill. Are you happy with the pace of instruction? The students always retained their enthusiasm, so the pace was fine. It seems like a long time to spend on one project, but with all the different parts of TechnoJourney, the students were always doing different activities and learning new things. They were always excited and looking forward to the time in the computer lab. The Internet Tour Guide activity was a great success using peer to peer teaching. Would you teach activities from TechnoJourney next year? Why or why not? Yes, I will certainly teach TechnoJourney next year. I plan to teach it in the first term, so that the students can benefit from using and applying the skills throughout the year. I think the safety guidelines are very important. Next year, before my students use the Internet, we will do these activities to ensure that they are responsible digital citizens. At the end of the project, your students participated in an Internet Tour Guide activity. What educational value does this activity have on your students? Students are reviewing and reinforcing the skills as they are teaching them to their peers. I’ve also noticed that the students’ self-confidence has been boosted. They’re very proud to show the other class what they know. This was especially important for some of the students with low self-esteem. I was surprised by how confident they were as they instructed the other students. In one word, how would you summarize your experience with TechnoJourney? Peer to peer teaching is an effective teaching method that can be used in the computer lab to enhance learning. This blog article examines an example of how this method was implemented, elements of successful peer teaching, and the educational value of this approach. What is Peer to Peer Teaching? Peer to peer teaching has students take on a teaching role in a school setting in order to share their knowledge with other students. "Internet Tour Guides" teach their recently learned skills to "Tourists"
I have been teaching the technology project TechnoJourney to a class of Grade 3/ 4 students. Each week students completed a range of Internet-based activities. To celebrate our learning, at the end of the project, another Grade 3 class in the school was invited to participate in an Internet Tour Guide Event. In the Internet Tour Guide Event, students became Peer Teachers. The Peer Teachers were divided into groups and then assigned a topic to teach. There were six topics: Super Searcher, Trust Test, E-Library, Picture Power, Learn with Videos, and Making Map. To prepare for the activity, prior to the event, each Peer Teacher group practiced teaching to each other using instruction sheets as a guide. This allowed them an opportunity to gain confidence in their ability to teach. To learn more, refer to the blog post, “Internet Tour Guide Activity“. The following week, the Grade 3 class visited the computer lab as “Tourists” or students that would learn about the Internet from the “Internet Tour Guides” or Peer Teachers. To get more than 40 students into the computer lab at one time required organization. 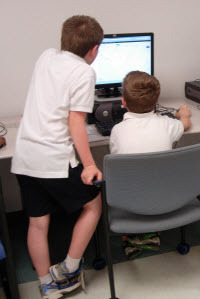 To start, the Grade 3 / 4 students arrived in the computer lab, assembled into their Peer Teaching groups, grabbed their worksheets, and then stood behind a computer chair. Student instructors were enthusiastic about their role as teachers. In the meantime, the other Grade 3 class was patiently waiting outside the computer lab. Once the peer teachers were ready, three to four students were let into the computer lab at one time, and directed to sit in front of a particular computer. Once everyone was seated, the activity was introduced. Students were told that they were going to become Tourists and would be taking a journey through the Internet. Their Internet Tour Guides (Peer Teachers) were going to guide them to online destinations. Tourists were informed that they needed to follow their Tour Guides’ directions. With over 40 students in the room and active teaching happening in every group, it was a busy but exciting place! The room soon became a hive of active learning as the Tour Guides were eager to share their newfound skills. The Tourists enjoyed the novelty of the learning experience from their peers as well as getting to visit new places on the Internet. After about 8 minutes the lights were turned off to signal it was time to move to the next destination. Once the room was quiet, the Tourists were rotated clockwise to the next group of Tour Guides. For example, the Tourists at the Super Searcher destination, moved to the Trust Test destination, the Tourists as the Trust Test destination moved to the E-Library destination, and so on. Although we ran out of time and only managed to rotate the Tourists through three of the six activities, it was a complete success. Consolidate Learning: By teaching to a peer, students review their own learning, which allows them to strengthen their own knowledge and skills. Increase Confidence: This type of learning activity boosts self-confidence because students realize that the classroom teacher perceives them as experts and trusts them enough to share their expertise with a peer. Develop Communication Skills: Students must use strong communication skills to be able to provide clear directions, listen to feedback, and then adjust the next set of instructions accordingly so that their peer is successful. Assess Learning: The teacher is able to assess students’ understanding of the material based on their ability to share their knowledge and skills with a fellow peer, that could not be accomplished using a paper and pencil test. I believe that at the end of each unit, time should be allocated to reflect upon the learning experience. This gives students the opportunity to acknowledge their achievements and recognize the newfound skills they have acquired. This can be a challenge when a unit of study does not contain a finished product to hang on a bulletin board, post on the Internet, or present on a computer screen. This is the case with the Internet unit we just completed. I wanted to celebrate the completion of TechnoJourney. Since the technology project was comprised of Internet-based activities there was not a final product that students could easily share. I decided the way to demonstrate our learning was to transform each student into an Internet Tour Guide. In TechnoJourney, students take a trip through the Internet and discover the wonders online. Since they were now Internet experts, I thought it would be fun for them to show the sites to someone else. The classroom teacher arranged for another Grade 3 class, who had not completed TechnoJourney, to visit during our computer lab time next week. The Internet Tour consisted of six activities: Super Searcher, Trust Test, E-Library, Picture Power, Learn with Videos, and Making Maps. Each activity focused on a skill that students had acquired while completing TechnoJourney. The classroom teacher divided students into six groups. Each group was assigned an activity that they would teach as part of the tour. During today’s class we prepared for the Internet Tour. To start, students gathered into their groups. I provided each group with an activity sheet that had a set of instructions students could use as a guide when teaching. As a group, students followed the instructions on the activity sheet and discussed other important elements they believe should be part of their mini-lesson. Next, students took turns teaching their fellow group members. Once familiar with their topic, I paired each student with someone from a different group. Each person from their new pair group took turns teaching their activity. Modified the Activity: One group decided that the activity was missing an essential skill and they changed the activity. Originally, the task had students use bookmarked resources such as encyclopedias, atlases, dictionaries, and thesaurus to showcase the valuable resources online. The group members decided that the activity should have visitors type the URL instead because this action would make the web address easier to remember. I agree! Made Notes on the Activity Sheets: Many students wanted to make sure that they did not forget important points while delivering their instructions. For this reason, they made comments on the activity sheets to help them remember. Excellent idea! Understood the Needs of Students: One group decided that they wanted their visitors to pick a topic instead of give it to them because it would make the task more interesting. Originally, the activity sheet had provided a list of videos to find on the Internet. Group members decided that they wanted their visitors to pick a topic they were learning about in school and find a video about that instead. Great plan! Next week is our Internet Tour Guide activity. I am looking forward to having students use their skills to teach their peers. I can’t imagine a better way to celebrate our success!